As the historical researcher on the project, it will be my task over the next three years to uncover everything I can about the way pilgrims experienced and interacted with our four cathedrals over the centuries. While I’m taking each cathedral in turn as a case study, starting with Canterbury, the kinds of questions I’ll be asking are quite fundamental – who went on pilgrimage and for what reasons? What did they do on the way and when they got there? 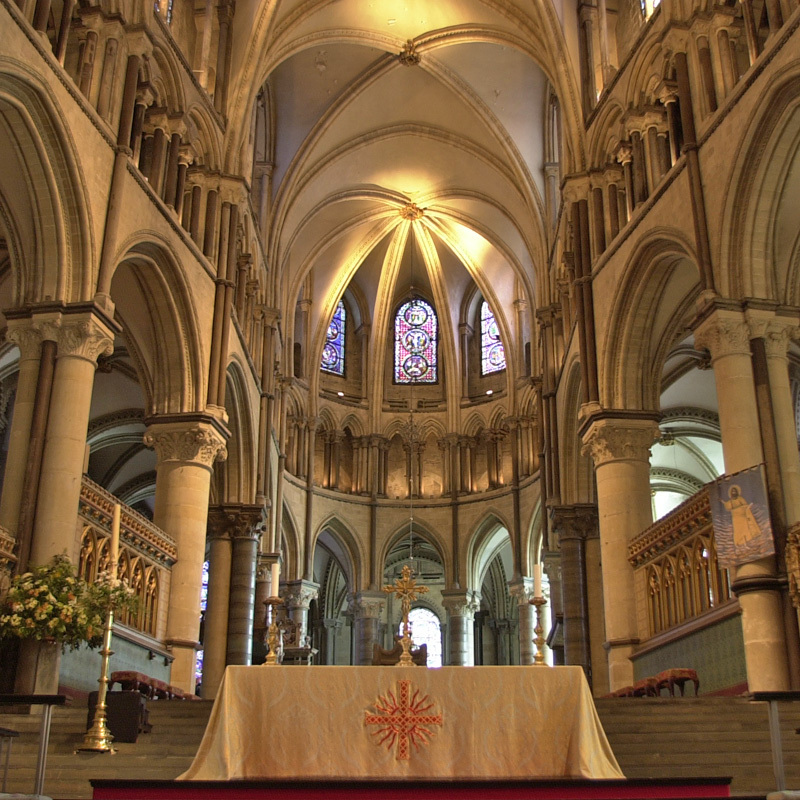 How did cathedrals cater for them, and how did pilgrim activity affect the cathedrals? Even, and perhaps most importantly, what made someone a ‘pilgrim’ at all? We may think we know a lot about medieval pilgrimage (we have Chaucer, after all!) but although it was widely practised there is little direct evidence to tell us about what it was really like. England’s cathedrals are now mostly stripped bare of all the ornamentation, hangings, and general ‘clutter’ of the late-medieval church. The medieval cathedral experience, however, would have been a multi-sensory one. The massive golden and bejewelled shrine may have drawn the eye, but pilgrims would have been able to smell the heavy incense and beeswax, hear the the chanted liturgy and tinkling bells, symbolically process through the sacred spaces, and touch, caress, and kiss the holy places themselves. A large part of my research will focus on reconstructing these elements and the interplay between them. From my initial research it is becoming clear that pilgrims had a wide variety of backgrounds, motivations, and expectations, and thus we can expect there was a broad range of experiences open to them depending on these factors. Some went to seek cures, others to give thanks to a saint for aid already received, and there were plenty who went with half an eye to see the most beautiful buildings and artworks in Europe. Not all were necessarily willing pilgrims – it was enforced as a punishment for heretics and adulterers alike! The season, the day, and even the hour at which the pilgrim arrived at the shrine would be key in defining his or her experience, and the nature of pilgrimage activity was also subject to great changes throughout the medieval period. Thus there may not be a single ‘pilgrim experience’ of the Middle Ages to recover, but there were a huge number of ways in which medieval people could experience being pilgrims. I’m working closely with Tiina Sepp, who is conducting fieldwork on contemporary pilgrims at these cathedrals, and we’re having some very interesting discussions about the many areas of overlap in what we’ve been finding. I’ve been lucky enough to uncover some really exciting manuscripts (on which more soon! ), and already it feels like we’ll have something really important to add to our understanding of pilgrimage past and present.